Now Get 10% Cashback on using “Visa Virtual Card” (New users only) which is Instant available in their Updated Udio App. Previously Udio is Providing Visa Virtual card on our Home Address But now They are Providing Instant Visa Virtual cards in their Updated Android App. So Hurry up and Update their App Now to eligible 10% Cashback. How to Get 10% Cashback on first Udio Transaction ? • Install & Open the Udio App. • Goto Menu > My Udio Card > Click on “Digital Card” and then “Activate Now”. • Once your Udio Visa Card is Successfully activated. • Now Add Money to your Udio wallet using your debit card or Netbanking or Freecharge virtual or any other Virtual cards. • Now goto Menu > My Udio card and get 16 digit number, Expiry date, CVV. • Now do Purchasing on any websites in India using Udio Visa Virtual debit card. 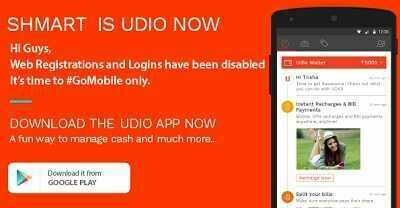 • Your Cashback will get credited to your Udio account within 3 working days (Not Instantly).